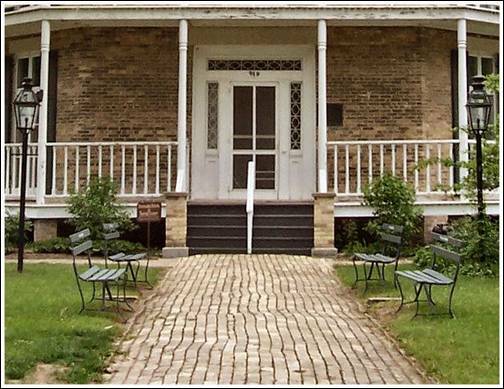 The Watertown Historical Society, owner of the famed Octagon House Museum, is pleased to announce that it will be offering for sale the original bricks that lined the former front walk to the famed eight-sided landmark. The historical society recently had the front walk replaced and having many bricks on hand decided to offer them for sale to the public as a fund raiser for the museum. Many of the bricks are over 100 years old and are original Watertown cream-colored brick. The bricks came from the front walk, the walk-way from the kitchen in the rear of the house, and also from the south side of the home. They had been in place for over 60 years. These bricks would be useful in landscaping, as a souvenir of the Octagon House, or as a unique Watertown collectible. The bricks are selling for $5.00 a piece. Those who are interested in acquiring bricks are requested to speak to Museum Manager Linda Werth. She can be reached during normal business hours, by calling (920) 261-2796.